Every coach and athlete looks for ways to improve. The search for a competitive advantage spans the range of technologies – from naked eye observation (basic) to synchronized video and force analysis (advanced) – that aim to help both coach and athlete. Gaining the most benefit from advanced technology involves employing a variety of analysis procedures. For example, technology that measures hand force clearly identifies stroke-to-stroke variations in how the hand presses on the water to generate force (Figure 1). When synchronized with video, force variations within each stroke indicate the exact arm position that limits performance. While these analysis procedures require time and effort, the potential for improvement is substantial – often more than .1 second per stroke – for even the fastest swimmers. 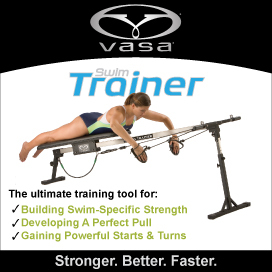 Swimmers with advanced skills can benefit greatly from information derived from the use of advanced technology. A comprehensive battery of analysis procedures provides quantitative data to augment a coach’s qualitative analysis. Advanced technology does not eliminate the work that coaches and swimmers must do to improve technique. On the contrary, such thorough analysis adds to the coach’s workload while making more effective use of his/her coaching skills. At the same time, the additional feedback adds to the swimmer’s mental load by requiring constant focus to master the technique changes. The extra effort is warranted, however, as advanced technology can be used to address technique limitations that would otherwise go unnoticed.